Last week I started a two-part food post on a picture book-themed baby shower. Here's Part Two, pictures of food, food, food. No, this wasn't my idea. First I must admit that all the lovely food arrangements you see here had nothing to do with me. I brought my dish and a couple of others that were on the list, so I could make a show of pulling my weight. But the other hostesses did all the Food Network/HGTV-type stuff. Seriously, I am not being modest here. When I gave a baby shower, myself, five years ago, I did it at a restaurant and asked the mother's sister to co-host it so she could do the decorating. So you can be assured that I did not provide the layout for the appetizer table you see to your right. I did, however, offer to do the vegetable platter that went along with the Peter Rabbit book that is on the left of the App Table. (The other two items are a Very Hungry Caterpillar fruit plate and a Stinky Cheese Man plate.) My computer guy came up with the idea to make the platter look like Mr. MacGregor's garden by laying the vegetables out in rows and making stakes with the veg names. He came up with lining the whole thing with waffle pretzels to look like a fence, too. I did do the actual work, though. There's that. Then, of course, we had the ever popular Make Way for Ducklings blue lemonade set up outside, too. This was really clever. On the other side of the deck was the wine station, which I didn't take a picture of because I don't think there's a picture book about wine. Back inside, the first item in the buffet layout was the Strega Nona...ah...I'm not sure what that was, because I haven't read Strega Nona. A pasta salad? Is Strega Nona about pasta salad? It was followed by a Count Your Chickens chicken salad. And then a couple of sandwiches, one seafood one some kind of chicken. No, I don't know what books they were connected to. The quiche was inspired by Green Eggs and Ham. This was another item I volunteered to make a week before the shower, because I was feeling guilty about doing so little. Not many guests were interested in meat, so I was asked to lean on the green part. I just threw the better part of a bag of fresh spinach into my usual quiche recipe. Except I accidentally bought a bag of fresh spinach with some other green. It didn't make any difference as far as the taste was concerned, but it certainly made the green eggs green. Spaghetti sliders! Also, pesto sliders. Then we came to my sliders. They had a spot to themselves right above the oven because they were hot. Yeah. Hot. There was a bowl of goldfish crackers (One Fish, Two Fish) on the other side of the room, but I missed getting a picture of that. Once again, not my idea. Very good cookies, by the way. ...some lovely Goodnight Moon cookies. Not sure who made those. That IS a Star Trek kids' book. To work the picture book theme just a little further, guests were asked to bring a picture book for the new child's personal library. A bucket of books is as attractive as any dish. 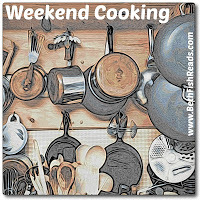 Today I am taking part again in Beth Fish Read's Weekend Cooking Meme. Another ambitious party theme that I'll probably never experience, much less participate in! But fun. Aww, your veg platter was adorable! I suspect the only thing I could have thought of was The Wind in the Willows for the wine; surely Ratty had some with everything else he had crammed in his basket. And How Are You Coming With Your NaNoWriMo Prep? I'm Baaaaack. With Food. And "Company's Coming."